I knew I wanted to do another Thanksgiving table post but as I was scrolling and scrolling through the endless inspiration on Pinterest I felt my eyes kinda just glaze over, overloading on all the orange and browns of fall decor. I love the holidays and I love decorating but for some reason nothing popped for me. 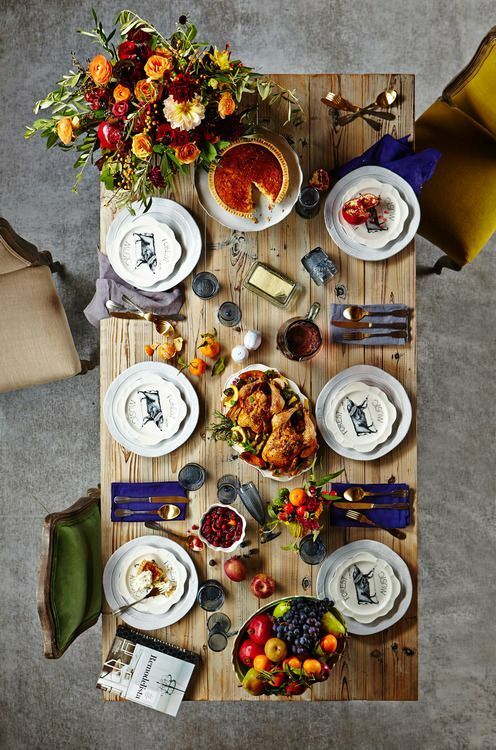 Then, I saw the first photo in this series of a Thanksgiving table from Anthropologie that features rich cobalt napkins and suddenly… Aha! I knew what I wanted to do, colorful, eye-popping Thanksgiving table settings. There are so many options to choose from when decorating for the holidays, whether you love traditional or minimal, but I wanted to step away from traditional pumpkin colored, cornucopia/gourd/squash decorating and have a little more fun – rustic, colorful, classy, and flower friendly. Pin to Win: Set Your Thanksgiving Table | Anthro Blog – They had the right idea when they styled this table, make one thing pop (the cobalt napkins) but bring in other colors from food and flowers to complement the rest of the table, which is actually pretty simple. Thanksgiving Table: Furbish | Design Sponge – Normally I’m not a fan of something so busy but I love that they incorporated pink with all kinds of baby pumpkins. 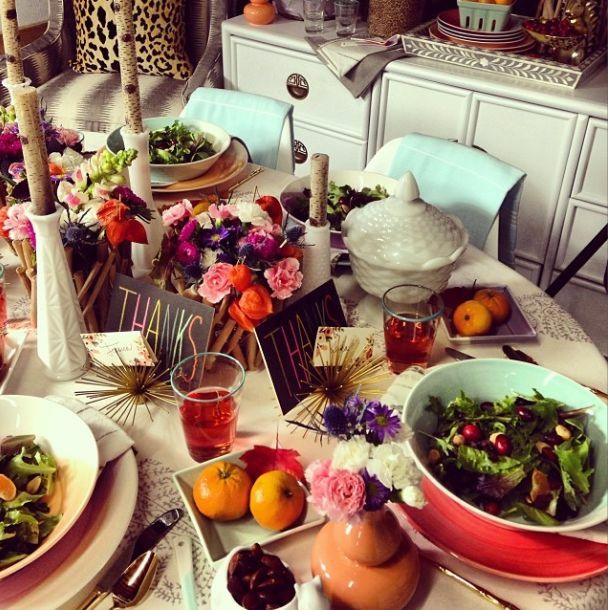 It’s extremely eclectic with so much pattern mixing but you can still see that it’s a fall table. 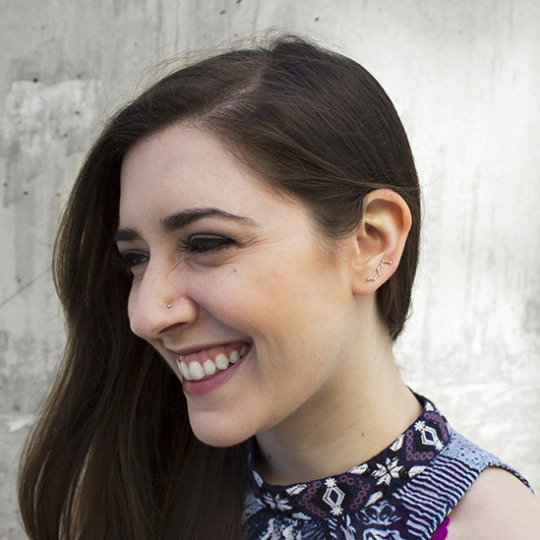 The Carlyle | amy merrick – If I lived in New York and was getting married, I would have Amy do the flowers because she’s a real artist. 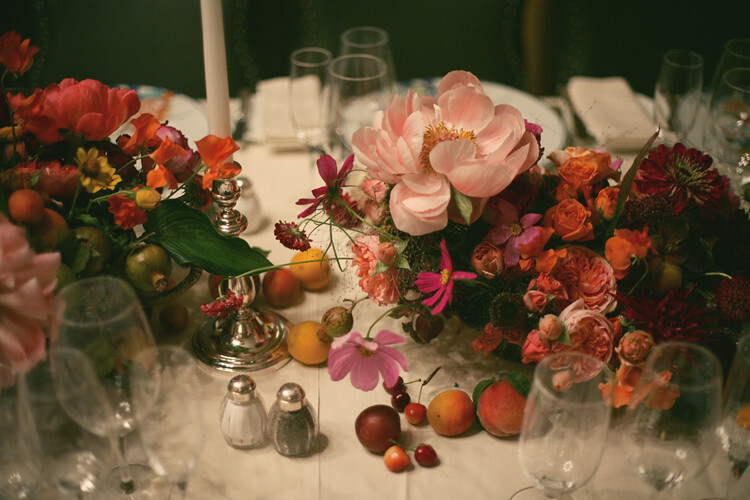 This photo was taken at a wedding but I think if you used fall fruits (pomegranates specifically) with orange, pink, and red flowers and classic dining wear, you could make a beautiful fall table. Weekly Wrap Up + Finch & Thistle Engagement Party | Design Sponge – For those who gather with friends instead of family at Thanksgiving this seemed like a simple table to throw together. 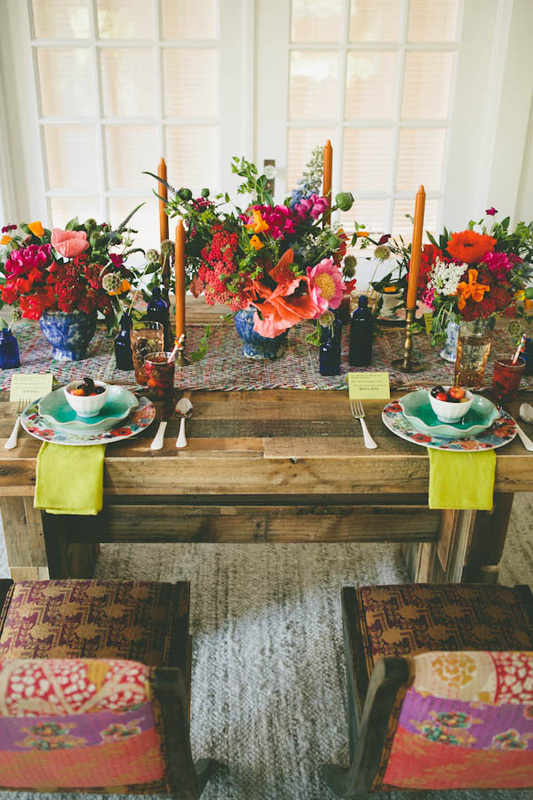 Confetti dots, gold spray-painted mason jars, and bright colorful flowers make it festive but not overwhelming. Fortunate Feast: Summer Tabletop | SCOUT blog – Yes, I realize this is a summer table, but look at those orange candles, dark blue glass bottles, and wild plates and bowls. It just looks fun and comfy, and once the sun goes down and those candles are lit, very romantic.